I’m in a much more grounded place than when I wrote my last post. I apologize for dragging back into the light the thoughts of others that would have been better left in the dark from which they were spawned. Part of my new mood is due to the total kick-assedness of Grindhouse. Rose McGowan was awesome in Planet Terror, but my admiration goes to (big surprise) Quentin Tarantino, who managed to take a girls-get-revenge movie and make it spectacular. The dialogue wasn’t as strong as it was in Pulp Fiction or Kill Bill. There were even some semi-funny/trying-too-hard references to Pulp Fiction thrown in. And, as usual, Tarantino’s cameos were hammy and cheesy (and probably any other breakfast sandwich reference one can come up with). Still, Kurt Russell pulled off the psychotic serial killer role with amazing ease, and the twist on his character at the end was perfect. 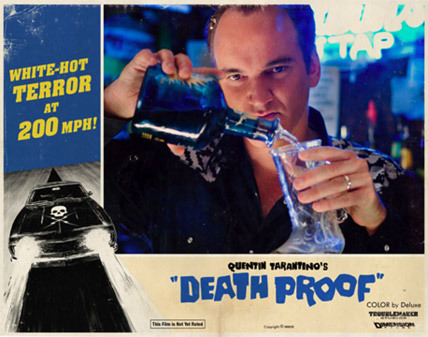 Tarantino deftly split the movie into two separate stories, bound only by the thread of Kurt Russell and his Death Proof car, neatly dividing the film between the sad tale of the victims and the story of unflinching heroes who refused to be killed. I can’t even explain just how much fun the whole experience was, with the flickering sound of movie reels, distressed film, funny-as-hell ‘previews’ (the pilgrim serial killer in Plymouth on “Thanksgiving” was hilarious). You just have to go see it. But, the real reason for the elevation of my spirit comes from a more unlikely place — Steve Jobs, via his commencement speech for Stanford University grads in 2005. It kept me on track, reaffirmed the correctness of my decision to be here, doing this, just when outside events tried to shake me off. I hope it gives the rest of you the same lift. This entry was posted on Friday, April 20th, 2007 at 7:03 pm	and posted in Uncategorized. You can follow any responses to this entry through the RSS 2.0 feed. Susan — Thanks for stopping by. I’m sorry you couldn’t sleep, but am somewhat relieved my writing wasn’t the magic bullet for knocking you out. Then again, I could have always started promoting myself as an addiction-free sleep aid.I’m glad you found the same inspiration in Steve’s words as I did.Go see Grindhouse. After you do, stop back by here and let me know if you had the urge to punch your fists in the air at the very end. You’ll know what I’m talking about when you get there. In my insomnia I am so glad I came here via Kate’s blog. We all need some inspiration every now and again so your words are welcome.I’ve been wondering about “Grindhouse” because of my own love of Quentin. Thus, your review excites me.And now I can take my day with a higher stop remembering what I read in Steve’s commencement speech. I always enjoyed connecting dots.Thank you for sharing this, Avery. Kate — Ah. Why complicate things?Christina — You’re a big horror fan, so I’m not surprised you liked Planet Terror better. I thought I would, too. I mean, hey, zombies.Sqt — Come on, the kids need an education.Jay — It’s not possible. Maybe he’s heard the mixed reviews and isn’t sure about it. I’d tell you to show him my blog to reassure him, but that’s probably not what you want, is it? Frankly, I’m surprised I haven’t been dragged to see this movie yet. It’s not my thing, but it’s very my husband’s thing. He was counting down the days – is it possible he’s forgotten about it? I’ll have to wait to see Grindhouse, I can’t really take the kids….Glad you’re feeling better. I liked Grindhouse too, but it was the first one of the two films that really stuck with me. I love that girls-get-revenge thing that was going on. It was pretty awesome. I feel like going and seeing it again, but the movies out here are way to expensive. Kate — Couldn’t let you swing by yourself. Did that come out right? 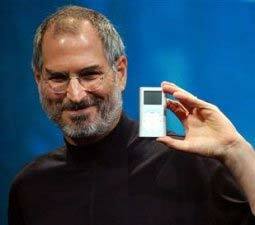 ?Stewart — “Stay hungry, stay foolish.” I love that. It sounds much more romantic than when put into actual practice, though. Stay hungry, stay foolish. I read about paths others have chose and how things have gone so well for them, then I look at my own and try and see where I might have tried different strategies. Ah, why is there something about the spring that makes one soul search? Glad you’re feeling better, Avery! (So sayeth the queen of mood swings) :)Thanks for the link to the Jobs speech – that was great.